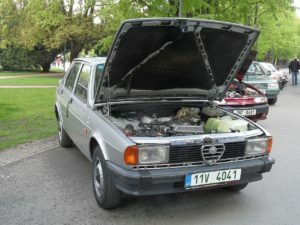 There was a rumour that Giulietta (tipo 116) 1.3 engine was originally intended for GTA 1300 Junior. Both those cars had oversquare engines with 67.5 mm stroke. GTA 1300 Junior engine was based on 1.6 Twin Cam modified with shorter stroke. Interstingly both 1.3 Twin Cam engines from Giulia Sprint era had 1,290 cc capacity (original from 74 mm bore and 75 mm stroke and GTA Junior from 78 mm bore and 67.5 mm stroke). Giulietta 1.3, introduced in 1977, had 80 mm bore and 67.5 mm stroke to capacity of 1,357 cc. Centro Documentazione informed me that: “there aren’t any links between the two projects”. Still not only this Giulietta was the only model to have this unusual engine it still produced 95 PS and 120 Nm. It was produced over 2 series till 1983 with total of 50.890 examples made.